When Blue Apron’s S-1 dropped at the beginning of the month, there was a lot of excitement, and rightly so. This is one of the fastest growing consumer businesses in the United States over the last few years, poised to do over $1 billion in revenue in just its 6th year since launch. It should go without saying that the team at Blue Apron has executed at a very high level to get the business to where it is today. The company has improved the way so many people cook and eat! Others have done a great job summarizing the details about the business revealed in the S-1, including honing in on the key set of questions: what is the true customer lifetime value (LTV) and cost of acquiring a customer (CAC)? How are these key metrics changing? And what does that imply about the business’s long-term prospects? Blue Apron’s filing reveals limited data to answer this question. One helpful analysis indicates an implied LTV:CAC ratio of 3:1. What most intrigues me, though, is the language that Blue Apron uses to describe its own business. As investors at Shasta Ventures in several consumer transactional businesses that have subscription models (e.g. The Farmer’s Dog, Imperfect Produce, Dollar Shave Club, Smule, Canva, Frame.io, Zwift, Hinge), the Blue Apron meal kit business model and metrics associated with it are of particular interest. One surprise? The words “Subscription” and “Churn” just don’t get used in the S-1! Of course, customer retention is key to understanding the long term prospects for Blue Apron’s business. A cohort analysis is a very helpful way to understand how customers subscribe and are retained over time, but the S-1 does not include such analysis. Fortunately, we have tools like Second Measure, which uses anonymized credit card transaction data to gain visibility on the performance of public and private companies. This data is not representative of true customer retention for Blue Apron, Hello Fresh, Dollar Shave Club, and Netflix, for it is based on a population % of U.S. consumers. However, it gives us a sense for what true retention looks like. Monthly retention is calculated as a median % for all cohorts based on if the customer transacted in a given month or in the prior month. I find this data very revealing. There is a large amount of churn in the first six months for Blue Apron, albeit at a less stark level than that for Hello Fresh. About 1/3 of subscribers are retained at month 6 for Blue Apron versus over 3/4 for Netflix and Dollar Shave Club. It’s important to note that where Netflix and DSC customers typically make one transaction per month, the average Blue Apron customer is purchasing 2–3 times per month, which makes the stark contrast in retention a bit more palpable. 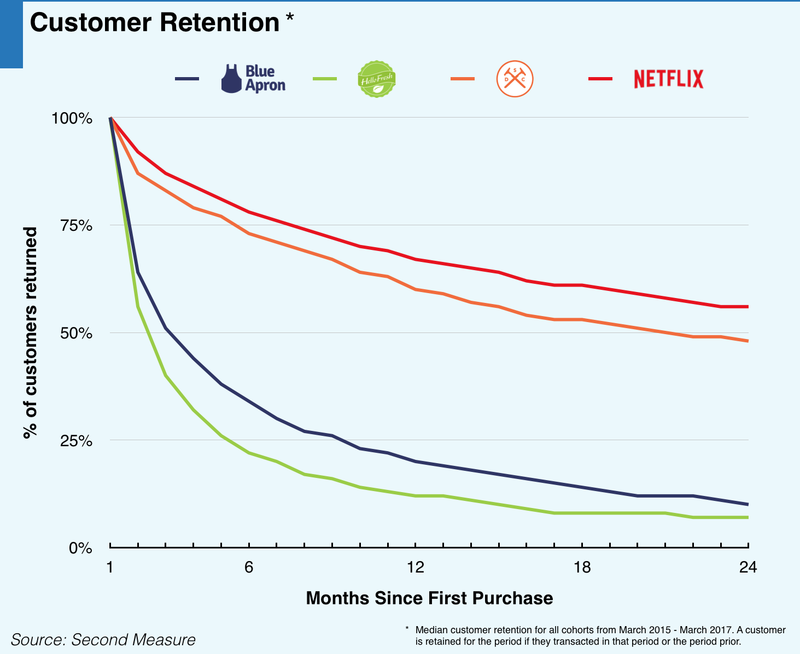 There is some leveling off in churn, but the retention asymptotes at a much lower level for Blue Apron and Hello Fresh versus for Netflix and DSC. So maybe this is why Blue Apron doesn’t use the word “subscription” to describe its business in its S-1. Given its retention versus other subscription businesses, Blue Apron likely won’t get valued by the public markets at the kind of multiples that subscription businesses command. For example, Netflix is valued in the public markets at 6–7X trailing twelve month revenue. We can reasonably expect Blue Apron to be valued at a lower multiple than this given its retention vis-a-vis Netflix, despite its higher annual growth rate and very impressive early traction. Blue Apron has clearly struck a chord with consumers, and many people love the service. But they get tired of being subscribers, and the majority move on after a few months. The big question for its long-term performance is how Blue Apron will address this significant churn. At some point, many U.S. consumers will have tried it out, cooked a bunch of meals, and no longer be subscribers. What happens then? It will be fascinating to see the story of Blue Apron unfold. This is the second in a series of posts on subscription businesses. The first on Dollar Shave Club is here. If there are companies you are interested in learning more about, or if you have any thoughts on subscription businesses, please post a response! And follow me to get the next post.